Don't feel bad at all about this. If they're smart, they'll heed your advice. As a local, family-owned business, they can't afford to serve Applebee's-style crap. You can ride your reputation for just a few years, you have to live up to it. If anything, you've done them a favor by calling them on it. As you know, as a follower of the Slow Food movement, I'm a huge proponent of local restaurants (I haven't eaten in a chain restaurant in YEARS) because they truly reflect the heart and soul of the local cuisine. If you can't be authentic, there's no reason to choose you over TGI Friday's. Here's to hoping they read this and do something about it. Don't you dare feel bad. Thanks for the support, Vron! I don't like the tone of my blog to be negative, but this food was so bad, and so overpriced for what we got, I felt like I had to say something. Especially because some of the reviews on Urbanspoon were so old and so positive. I do hope they read it and hire someone who gives a damn to run their kitchen. There are certainly enough good people out there who needs jobs right now. You need to be honest in your reviews, people expect that of you. 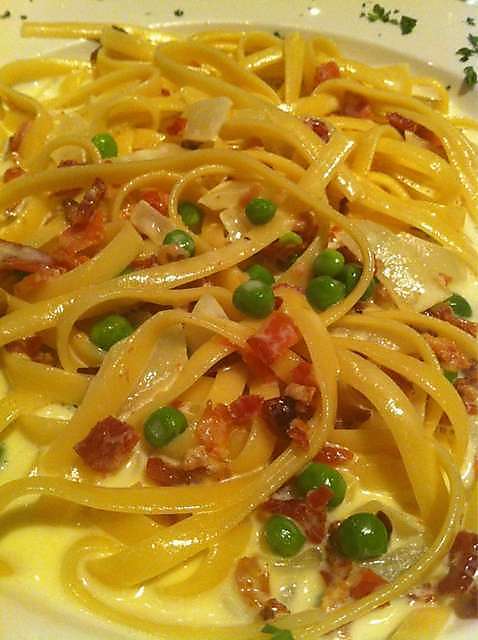 The carbonara may be unforgettable, but not in the way they would like. It's a shame when a beloved restaurant goes downhill like that. I agree Gwen, and I never, ever, like to hear of a small business going under. But some changes need to be made. I hope they read this and submit themselves into Restaruant Impossible! Nirchi's is an empire in these parts - their pizza is what all the Binghamton expats remember and loved from their childhoods. Nirchi's On the Avenue does have some questionable dishes sometimes, but the Steaks are always very good, and they also have the best veal dishes in the area, I cant say it is fair to judge a place based on a carbonara? Also I have been several times and I have to say the wait staff is one of the best, I've never had a rude server, in fact last time I was in I had a very young server who I expected to be unknowledgeable and slow, I was very wrong, he went out of his way to make sure everything was great and even recommended a wine to us that was great and a new favorite of mine (Hess Cab). When you review a restaurant you should review all aspects of it, service, wine selection, dessert, cleanliness, not just a pasta dish. this is a local family restaurant that the southern teer should support!!! This wasn't a full review, which I stated in my post. However, I disagree that a diner can't judge a restaurant based on one meal. People's disposable income I slimited - how many tries do you think most consumers will give an establishment? Also, Nirchi's is billing itself as an Italian restaurant, not a steak house, so I wouldn't presume the steaks would be the standout. I don't disparage Nirchi's wine selection, but again, that is not something every diner is looking for. Moreover, I agree completely that we need to support local, family-owned businesses. If you read more of my blog, you'll see that that's why I blog in the first place. That doesn't mean I'll send my readers to a place that's not worth their hard-earned money! More so than chain places, we should expect our local restaurants to provide great food prepared with care and served in a clean, contemporary environment! You've been misled by server jargon, so it seems. Generally when a server tells you a dish is "popular", it's because it's the best thing they can say about it. They're damning it with faint praise, if you will. A lot of people may very well order it, but it doesn't mean that it's any good. If you're looking for a quality recommendation from a server, ask them what dishes they themselves like, or give them a general idea of the kinds of flavors you're looking for. They should be able to help you find something on the menu that suits your taste. By all means, however, don't just ask for the "best dish on the menu" or ask the server "what's good here? ", as both of those questions are highly subjective, and the server isn't going to know your particular tastes unless you're a longtime regular. Well said!! I discovered your blog and am adding you to my favorites from Jennifer over at Home in the Finger Lakes. I live in Greece, NY, a burb of Rochester. I couldn't agree with you more. What I think they are trying to do is just like you said, hire lesser qualified ppl to take place of a professional, and then justify it with lesser quality ingredients. I doubt very much their dining room was packed. I doubt very much it ever is. The bottom line is; whether you have gourmet tastes or not, you can always taste a failure. Business is probably down explaining the dated decor. Why can't ppl wake up!! So glad to have found your blog. Off to look for you on FB!! Thanks for reading, Didi! Where do you love to eat in Greece? I went to school in Geneseo, and I love Tom Wahl's and Rohrbachs! Big hungry Shelby is a troll nothing more. Trying to feel important by lying on the Internet about someone your jealous about. Classic troll/broome county behavior.